The New York City Department of Records and the New York State Archives have released 14 million records to Ancestry.com. This includes birth, marriage, and death records for New York City, which were and are still indexed by the Italian Genealogical Group and the German Genealogy Group. Previously, these records were searchable by visiting the websites of these two groups or through one of my favorite genealogy websites, stevemorse.org. The 14 million records also include the index to the 1855 and 1875 New York state census populations, which have been available at FamilySearch.org. I’ve already found many records for my ancestors and relatives within these indexes outside of Ancestry.com, and I’ve ordered many record certifications of vital statistics from the Department of Records, but having these records completely incorporated into the family tree might provide some new hints towards details that I haven’t yet noticed. Here’s the entry for the family of my second great grandfather, David Sturmwald. The Sturmwalds are likely my only ancestors to be living in the United States as early as 1875. 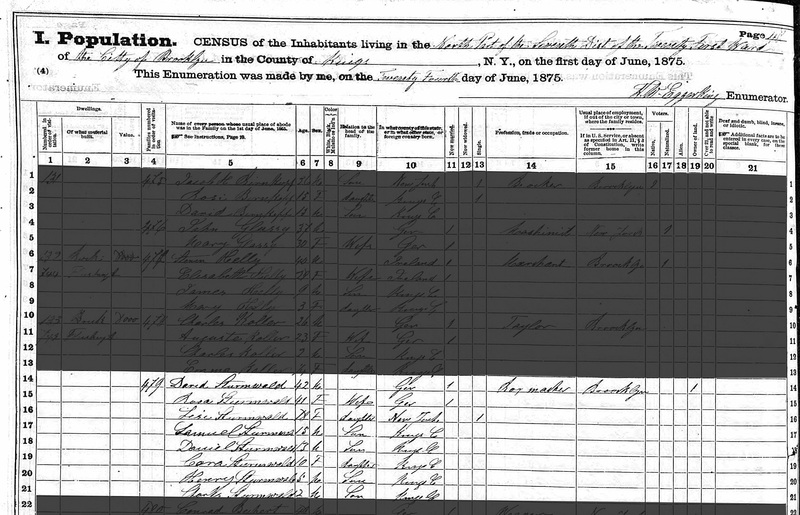 David Sturmwald arrived in the United States from Bayern (Bavaria) in 1849, but I haven’t found him in the earlier 1855 New York state census. Good job Harlan and good luck with the rest!